Holly Blackford: ‘Childhood and Greek Love: Dorian Gray and Peter Pan’. Children’s Literature Association Quarterly, Volume 38, Number 2, Summer 2013 pp. 177-198. This essay argues that both Oscar Wilde’s The Picture of Dorian Gray and J. M. Barrie’s Peter Pan offer studies of eternal male children and their consciousness because studies of congenital inversion and childhood were linked in the late Victorian period. Representing the coalescence of three late Victorian fields—developmental psychology (then called Child Study), sexology, and Greek studies—Wilde’s Dorian and Barrie’s Peter Pan embody perceptions of queerness, hedonism, and arrested development theorized as congenital inversion yet paradoxically understood as the free-floating desire of youth before a “proper” love object is chosen. The Wildean no.43, July 2013. The following articles appear in this issue. For a Table of Contents covering all issues, click here. ‘Faithful Infidelity: Charles Ricketts’ Illustrations for Two of Oscar Wilde’s Poems in Prose’ by Jeremiah Mercurio has just been put on line. Click here. Crane 100% cotton paper, hand sewn, and hand bound in Iris linen with a printed cover design by Joanna Darlington. It is rare that an important contribution by a major author goes unrecorded. Rarer still if the author is Oscar Wilde, the famous poet, writer, dramatist, and much quoted wit, who has been the subject of continual interest and analysis since his death in 1900. But such has been the fate of his 1885 essay The Philosophy Of Dress which now forms the centerpiece of this unique collection of Wilde’s writings on dress and fashion. In addition, there are generously annotated and illustrated chapters that analyze the importance of dress to Wilde’s writing career, and a comprehensive review of the influences, trends, characters, and source material that informed his dress philosophy. As a compendium this book includes several period articles and letters by Wilde on dress and fashion, along with related, but rarely published, correspondence. Oscar Wilde continues to be favorably reappraised as one of the most culturally avant garde tastemakers of the l19thate nineteenth century. In an ever fashion-conscious world it is fitting that the themes explored, like the author himself, are still relevant. In this respect the book will be of historical value to fashion students and practitioners. John Cooper has spent 30 years in the study of Oscar Wilde. Online he is the author and editor of the noncommercial archive Oscar Wilde in America, blogger, and moderator of the Oscar Wilde Internet discussion group at Yahoo. For the last 12 years he has specialized in new and unique research into Oscar Wilde in New York, where he conducts guided walking tours based on the visits of Oscar Wilde. In 2012 John rediscovered the essay The Philosophy Of Dress by Wilde that forms the centerpiece to his new book Oscar Wilde On Dress. The FIRST EDITION in book form of Oscar Wilde’s The Philosophy of Dress. Previously unpublished correspondence to and about Wilde on dress that appeared in Pall Mall Gazette which informs Wilde’s essays. Thorough analyis of Wilde and his relationship to dress and fashion. 36 illustrations and more than 200 footnotes and commentary. The International Health Exhibition of 1884. Wilde’s famous quotation about fashion. Many contemporary books and authors on dress familiar to Wilde. The Rational Dress Society and the Dress Reform Movement. We are pleased to announce the publication of ‘At home, 16 Tite Street’, by Richard W. Hayes, an essay on Wilde and Godwin, in Biography, Identity and the Modern Interior, edited by Penny Sparke and Anne Massey. Ashgate Publishing 2013. 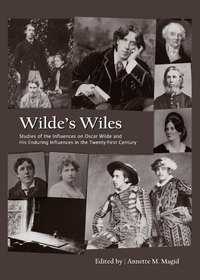 The book is a collection of essays from an international perspective which celebrates the diversity of Oscar Wilde’s genius and his influence on a broad spectrum of subjects including: aesthetics, family influence, friendships, children’s literature, women’s issues, consumer economics, queer theory, politics, theater, film, poetry, children’s literature, Victorianism and other aspects of culture such as pedagogical approaches to Wilde’s literature. Chapter Three: Loretta Clayton’s The Aesthete and His Audience: Oscar Wilde in the 1880s. Chapter Six: Annette M. Magid’s Wily William: A Study of William Robert Wills Wilde. Chapter Ten: Heather A. Evans’ “Is he not solid gold?”: Sacrifice, Soldiers, and Fairy Tales at the Royal Military College of Canada. Professor Annette M. Magid, Ph.D.